Whilst the bricks and mortar were coming together at Macualta Place, the Shepparton Villages Board of Management had moved on to planning the $18.2m redevelopment of residential care facilities at Rodney Park Village in Mooroopna. The plans were announced earlier this year and work is scheduled to begin late January 2019. A fundraising campaign will be launched in 2019 to help finance this exciting next phase in the five year capital plan for Shepparton Villages. Click here to make a donation towards the new Mooroopna Place development. The redevelopment will see the refurbishment of Grevillea Lodge and Boronia House and a complete rebuild and extension of Waratah Lodge – bringing the three 30 bed facilities under the one roof to be known as Mooroopna Place. An additional 10 beds will be added to Mooroopna Place, bringing the total to 100 for residential care, with the building to feature one central reception and community area. “Like any home, an aged care facility requires upkeep and renovation if it is to provide an environment that is comfortable, welcoming and safe. At Rodney Park this means we need to undertake major renovations to ensure our Mooroopna residents have the same beautifully modern, functional and comfortable home as our residents in Maculata Place have,” Kerri Rivett CEO said. “Our model of care that centres around choice for residents has to a large extent dictated the building design. The buildings we are designing, like Maculata Place, are communities not aged care facilities. 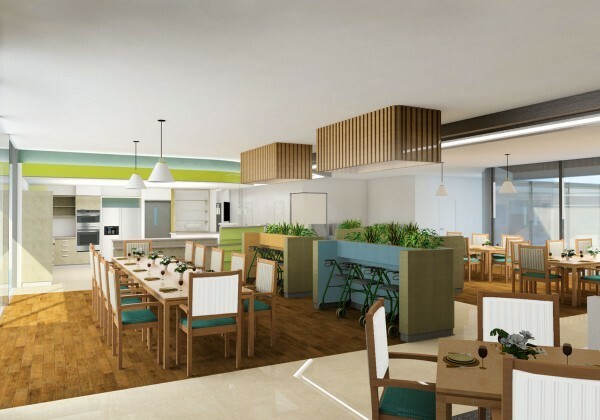 The entry replicates the community with hairdressers, consultant rooms and the gym, while the dining and lounge areas are the cafes and social meeting places. Corridors are the streets that then lead to the residents’ homes- their beautifully appointed rooms,” she said. The new refurbishment will not affect the 93 Independent Living Units that are located on the Rodney Park site. The Board has committed $18.2m for Rodney Park, on the back of the $34m spent on Maculata Place at Tarcoola, demonstrating considerable investment in the future of aged care in this region. “As you can imagine, any redevelopment of existing facilities requires a lot of forethought, logistical planning and discussion with residents, their families and staff which began with meetings and information sessions at the end of 2017. Kerri and her team will continue to update all those involved as we progress with this redevelopment, but we hope that residents and their families will be confident in our ability to deliver once they see Macualta Place and what we can do,” Ms Asim said. Rodney Park residents will be relocated temporarily to the old Hakea Lodge building and some to Macualta Place during the redevelopment. “It is important our current residents remain part of Shepparton Villages as these residents are part of our family.,” Ms Rivett said. “We are committed to ensuring the aged in our region are cared for in homes that reflect their expectations and those of their families and our community. We’ve shown what can be achieved with meticulous planning, consultation and forethought and we can’t wait to bring that same level of quality to the redevelopments in Mooroopna,” Ms Rivet said.